In 1948, Dorothy Slamin Hill of Waltham Massachusetts formulated the Waltham American Legion Band to support patriotism in America. 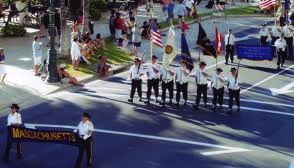 Since then, the band has performed before Government Officials, Celebrities, Politicians and War Heros. Past members of the band have played with Tommy Dorsey and Artie Shaw. It took three years to get permission for the May 1990 overseas trip to the USSR to become the first American Band to ever play in Moscow’s Red Square. 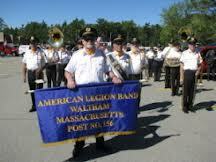 The Waltham American Legion Band performed God Bless America as part of the city’s annual Victory Day Parade. The nine day trip included Boston Mayor, Raymond Flynn and more than 70 band members. Today, the band consists of about fifty members both veterans and civilians ranging in age from teens to nineties hailing from Massachusetts, New Hampshire and Rhode Island. Performances include concerts, parades and special events most recently appearing in Washington, DC and Canada. The band has traveled to Great Britain Germany and Ireland as well as stateside trips to Hawaii, California, New Orleans, Reno, Salt Lake City and Louisville. The band supports itself through paid performances and fund raisers donating money to educational causes and local scholarships for young people interested in music. Members of the band volunteer their time and donate their services to support the efforts. Open rehearsals are held at the Waltham American Legion Post 156, 215 Waverley Oaks Road, Waltham, MA on Monday evenings from 7:30pm to 9:30pm. Click here for more information on joining this great band.